Its brunch time again! This time, at a new restaurant on Queen West called Destingo. 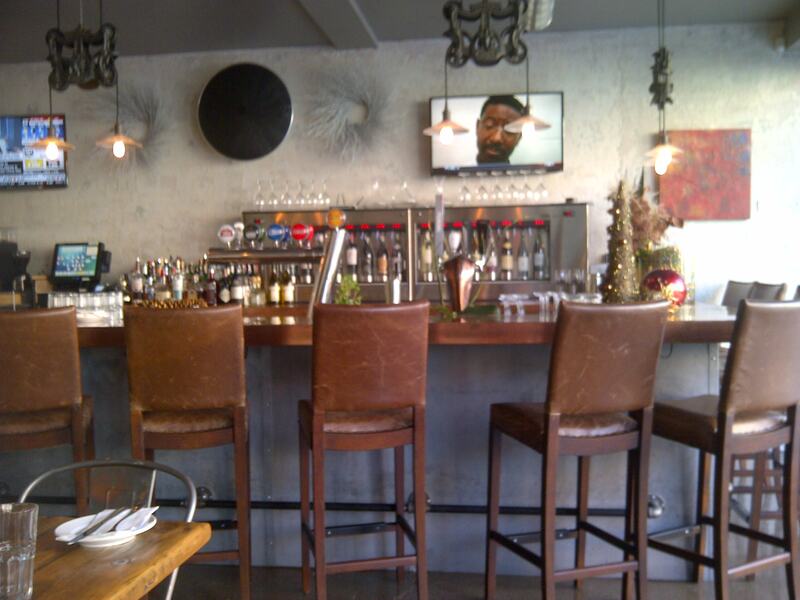 Destingo is a contemporary, casual Italian restaurant owned by Monika Vacca, whom was the former co-owner of Vaticano in Yorkville. Destingo means destined to go, and the resto is described on their website as being about “you experiencing really great food with even greater friends and family.” Sounds like a great concept, so a great friend and I headed down on a Friday morning to give their breakfast menu a try. 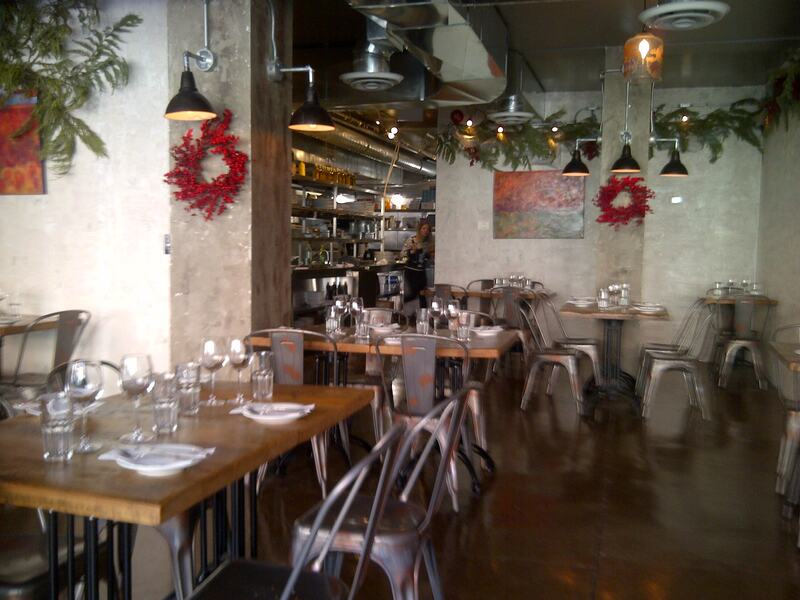 Destingo is a beautiful restaurant with a modern, yet almost industrial feel. It is quite spacious and looks from outside as it may have some lovely front patio space for warm weather months. When we visited, the resto had some tasteful holiday decorations on the wall. There is a sizable bar and lots of natural light. I really liked that I could see right into the kitchen from the dining area. Eating in restaurants, I really appreciate open or viewable kitchens. It sounds silly, but I think it is good to know that kitchen staff has nothing to hide. Our server was extremely friendly and warm. 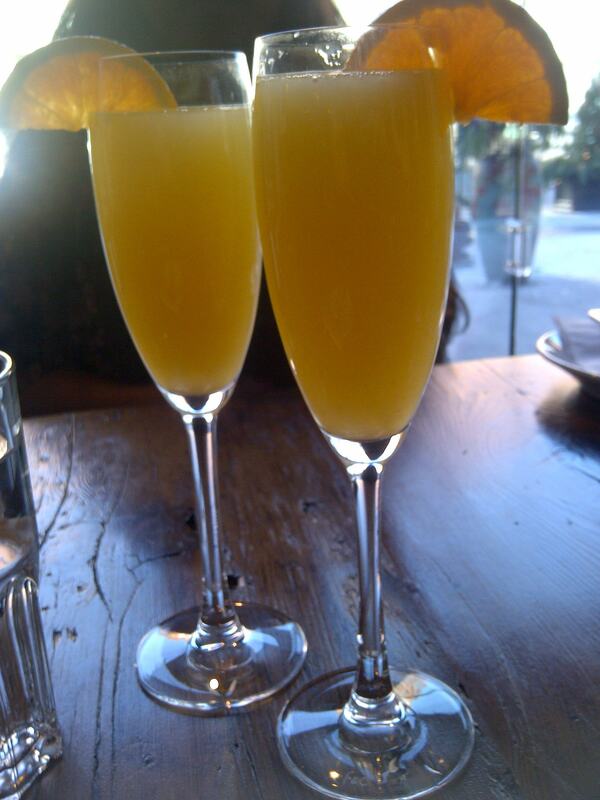 I arrived a little later than my friend and she offered to bring me a mimosa (my friend was having one) right away. Yes, please! She was extremely knowledgeable about the menu and made excellent suggestions. Everything was brought promptly and we were checked on often. She even went the extra mile, running across the street to get us some charge when we paid. The brunch fare at Destingo was excellent. On the menu they offered both breakfast fare, and a section called “If You Don’t Feel Like Breakfast.” This section included delectable dishes such as mussels, pasta, pizza and a shrimp burger (I will have to return to Destingo for that one)! We decided to order two meals and split them. This is always a great option for maximum taste testing! The Benedict Royale was a delicious spin on a classic eggs benny. 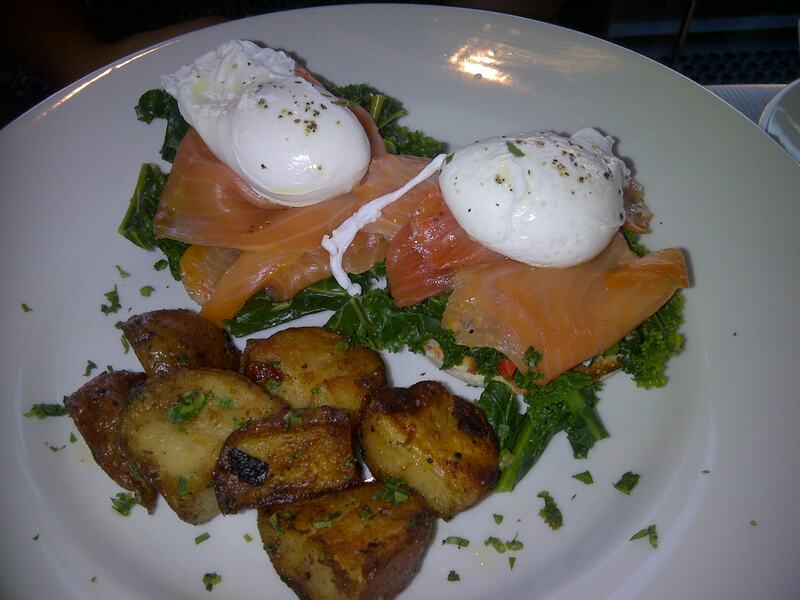 Poached eggs were served atop an English muffin with smoked salmon and kale. We ordered the hollandaise sauce on the side. The eggs were perfectly poached and the salmon was top quality. We had never had a Benedict with kale before and were pleased at how well it worked with the other flavors. The hollandaise sauce was surprisingly light and well seasoned. Our second choice was something a little less traditional. Look at the size of this pancake! 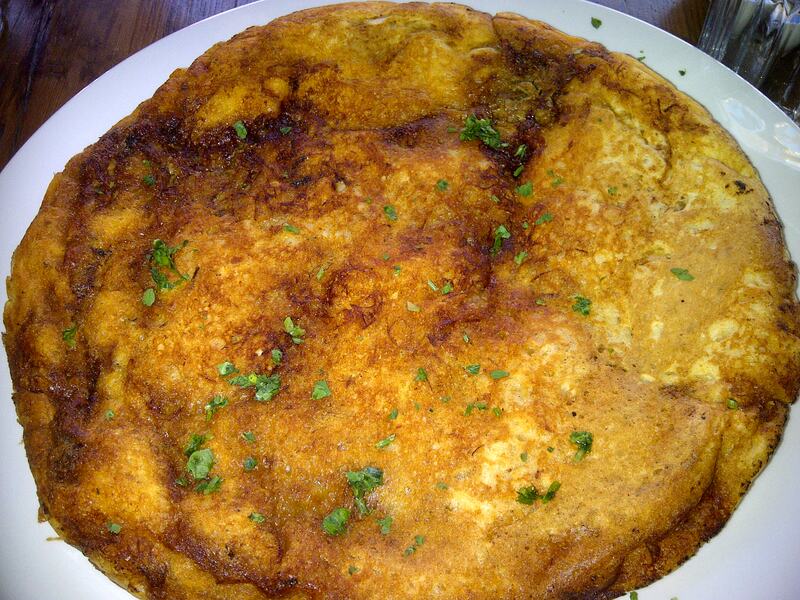 The porchetta pancake was a light and fluffy pancake filled with delicious pulled pork. It was served with Jack Daniels syrup! These flavours paired absolutely perfectly together. It was a gigantic portion and although we were stuffed, we just couldn’t stop eating this pancake. Such a delicious and creative dish. The brunch items at Destingo are all between $10 and $15. This is about average for brunch at a nice resto. I feel that the value is very good, considering that a great deal of care was obviously put into developing menu items, everything is made with fresh top quality ingredients, and portions are generous. We couldn’t even look at food for the rest of the day after this meal. I would definitely recommend Destingo. It was a lovely brunch spot and I look forward to returning to try it for lunch or dinner. The location of the resto also makes for some really great post-meal shopping/walking. So this will also definitely need to be repeated. If you have dined at Destingo, I would love to hear about it below. On the Prowl – TNL Meets Mel B! Season’s Greetings from your TNL gals! 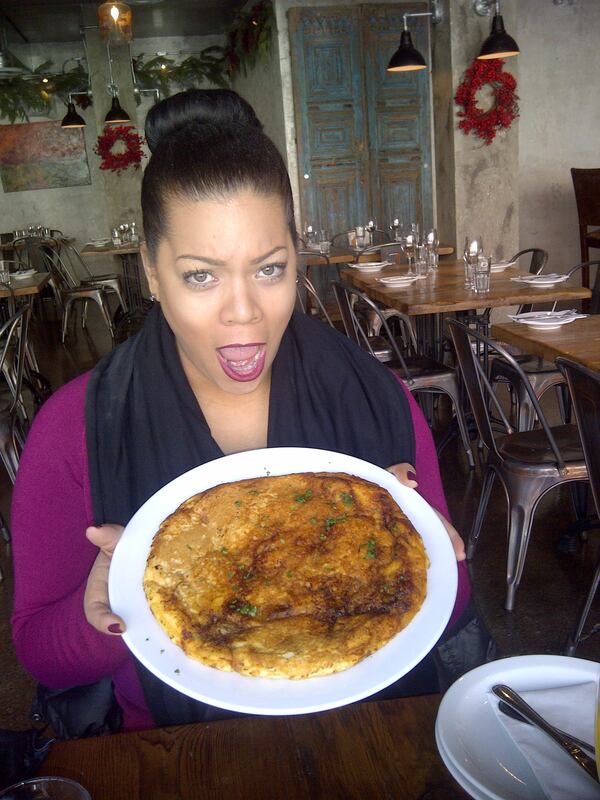 Porchetta pancake?! Pork and pancakes are two of my most favourite foods! This place sounds great! Thanks for the review and info!